Leads and sales are also the reason why I'm a huge proponent of optimizing services and products pages. If a Google searcher lands directly on a page that is selling what they want, there's a strong likelihood that this will convert into a lead or a sale. 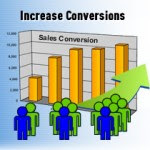 Leads and sales often come with a high price tag and are what I call "large conversions." Any conversion that potentially costs money is going to be harder to get than one that is free. And let's face it, not everybody is in the market to purchase right now. Some are just looking for information about your particular industry. Others may be trying to learn how to do for themselves what you are doing. And still others may be doing research for sometime in the future when they may be in the market. Adding value to your website through free articles, blog posts, videos, and any other type of content that may be helpful to those at the not-ready-to-búy-yet stage, is a great way to gain extra traffic. The problem (if you want to call it that) with all this "value-added" content is that it brings those very people who will rarely convert into a lead or a sale. They're mainly there to partake of your free information. They want answers to their questions, and once they get them, they leave your website with nothing to show for it other than a "100% bounce rate" mention in your analytics report. Rather than having them bounce off your website, you should be trying to convert them in some small way. That is, providing you're not-in-the-market-right-now site visitors (or freeloaders!) with one or more quick, painless (ideally measurable) actions they can take. These could be anything that keeps them connected to you and/or your website in some way - signing up for your free email newsletter, following you on Twitter, "liking" your Facebook page, subscribing to your YouTube channel, etc. "If you liked this blog post, allow us to email you when we've posted others." "If you want to learn more about _____, sign up for our weekly newsletter." "If you want to stay abreast of what's going on in ______, be sure to follow us on Twitter." Another type of small conversion is to get the visitor to at least click through to your services or product pages. For instance, if you have a lot of how-to content that shows people the ins and outs of the very services you provide - make sure it's extremely clear that you don't just teach it, but that you also provide the service. (You'd be surprised how many people don't realize it!) There will always be some people who decide that doing it themselves is too daunting a task. "Learn how we can help you do ______ today!" If you are prominently featuring small conversions on your website but not seeing much action, it could mean that your content isn't providing what the visitor hoped it would. Or worse, it could mean that it's just not very good. This is common if you're creating your content for search engines, not people. After all, why would people want to be notified when you've added more crap content? Take your low conversion numbers to heart and invest in content that fulfills a real need. The whole idea of having small conversion points where people sign up to hear from you regularly is so that you will always be at the top of their mind and not forgotten a few minutes after they leave your website. Today's not-in-the-market-at-the-moment guy or gal may one day be a ready-to-búy-now guy or gal. When they make their Jekyll to Hyde switch, you want them to feel that there isn't anybody they'd rather purchase from than the one who's been nurturing them along from the very beginning of their quest - YOU! long planned vacation away to some tropical destination or elsewhere in the world. becomes the main supporter of your holiday.